My afternoon companions today were Harry Potter and this Disappearing Nine Patch quilt for the Doll Swap Challenge group on Flickr. 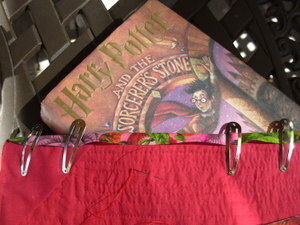 And, no, I didn't read while sewing. I read first, then sewed. I'm nearly done with this first HP book and I'm also listening to the 6th book on my iPod. We'll be listening and/or reading the others in time for the next and last installment. 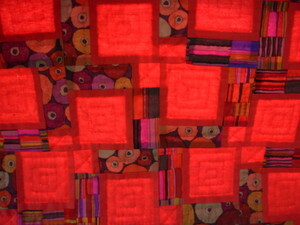 I was sitting out on the patio and I happened to hold the quilt up and the sun shining through left a warm red glow. 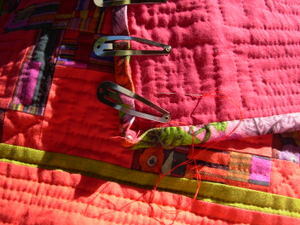 I find the hand sewing of the binding to the back of the quilt to be almost a meditation. The same stitch all the way around. And it's done just in time for the end of June. I'll be starting the July challenge this week. 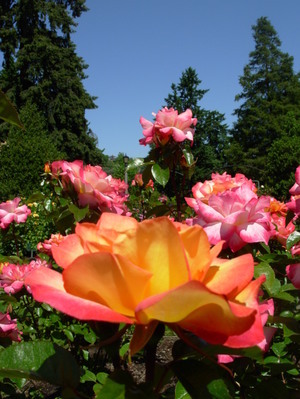 I love the colors in this one and planned all along to have it hanging in the living room. It's in a spot where I'll be able to see it everyday. This quilt is about 19.5 inches square. It's machine pieced and hand quilted. 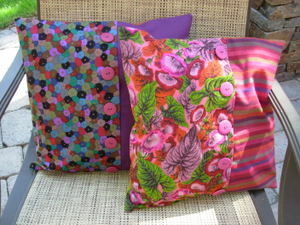 These are Kaffe Fassett shot cottons and I believe the two prints in the blocks are KF's also. 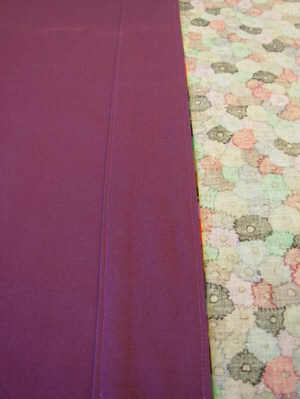 The binding print is done by someone else. 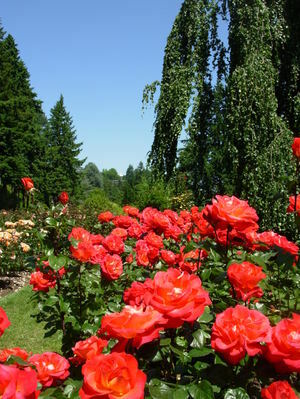 I've also categorized this post under Project Spectrum because red is one of the colors for June/July. It's official. 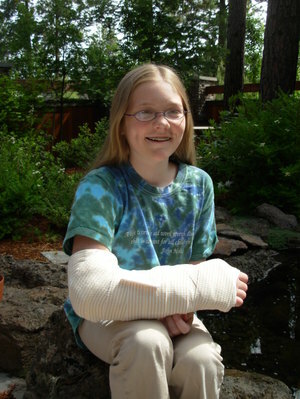 Chloe has broken her arm. It happened when she fell out of a tree at the park last night. I can't believe how often it has happened that we were at the emergency room the night before a trip. Ryan did this a bunch of times, getting stitches the night before trips to Hawaii. Anyway, she's doing well and is still quite cheerful despite knowing there will be no swimming, no tennis and difficulty writing. We go back on Monday for a permanent cast. And now we are off to Portland because, despite the pain, she is determined to make it to tomorrow night's performance of Wait, Wait, Don't Tell Me- The NPR News Quiz. See you in a few days! I updated my sidebars, including the blog links. 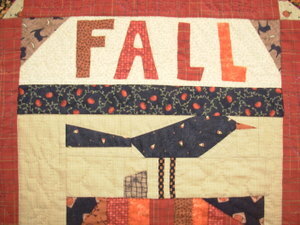 I've recently been finding some really great quilt blogs. 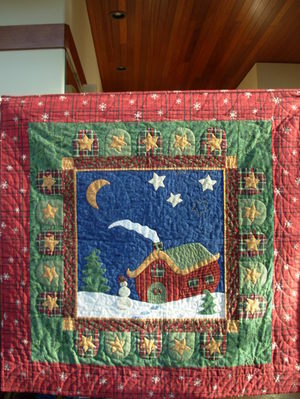 When I started this blog, it seemed there were very few dedicated to quilting, but there were tons of knitting blogs. I'm glad to see the quilters coming out and sharing as well. 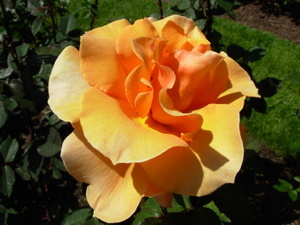 Here's a few I want to mention because they are new to me and may be to you as well. 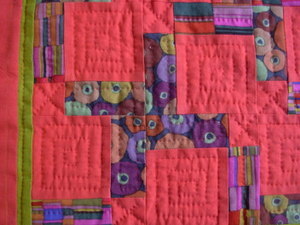 A Stitch in Dye has some marvelous color quilts. I discovered this blog while surfing around on Flickr. Malka is also a homeschooling mom! Celtic Knots is not really so new. 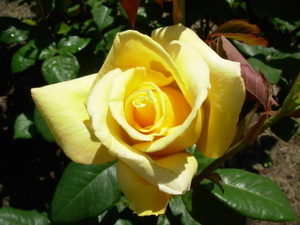 I found out about Cathi's blog after she contacted me last Christmas. It turns out her parents live in Bend and she lives in Ireland. 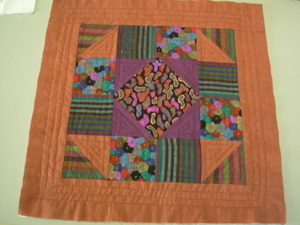 I hope we get to meet next year for the Sisters Quilt Show. 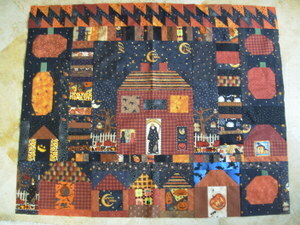 Crazy Mom Quilts is just as the title suggests. Lots of ideas and stuff coming quickly on this blog. I also love her use of color. 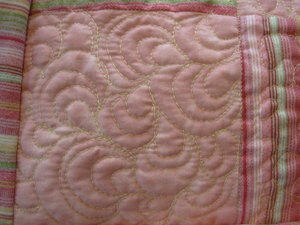 Lazy Gal Quilting is one I discovered fairly recently. I just read all of Tonya's archives and found it to be really interesting. Not only does she live overseas (Egypt first and France, currently), but she is the queen of liberated quilt making. I love her word quilts and liberated houses. I wish I could be half as productive. 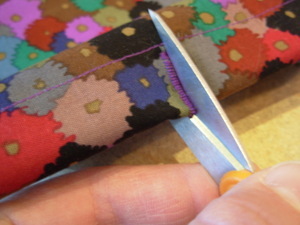 You have to check out her hand quilting too. Such beautiful stitches without a hoop! 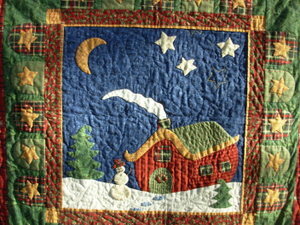 Life's A Quilt is Hedgehog's blog and she's based in Finland. 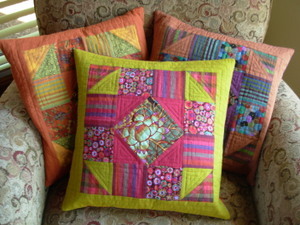 I love to see her photos of the region and her quilts are really pretty. She's had some string quilts recently that are nice. Quilt While You're Ahead is totally new to me. I just love her new little quilt based on the techniques of Janet Bolton. She even got to take a class with Ms. Bolton herself! 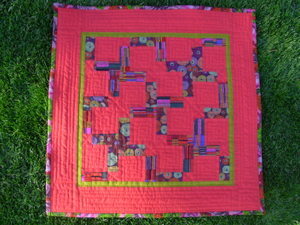 Quilt Antics is also very new to me. 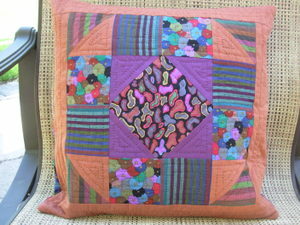 I found this one by googling "quilt blog" and it turns out that Robin lives on Maui. 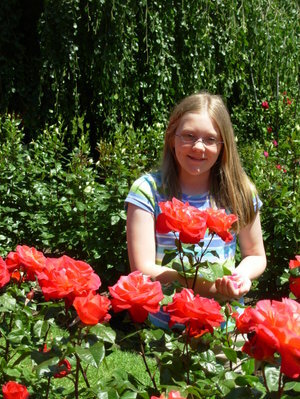 I just had to contact her when I found this out because we lived there for a year in 2002-2003. I wish I could have met her at the time. 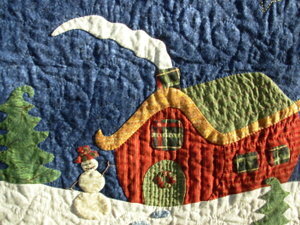 We might still be living there if I'd had a quilting friend on the island. 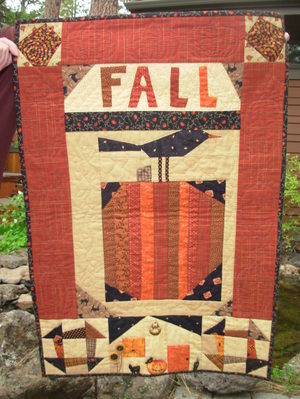 Anyway, she has the most amazing modern style quilts done in the style of Nancy Crow. She also sells on Etsy and I just bought one of her hand-dyed silks. 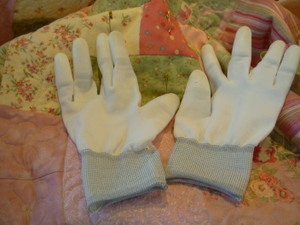 She has several posts about hand-dyeing fabric which are very interesting. 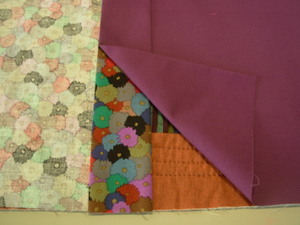 Spirit Cloth is a very interesting blog which is a journal of the making of a very special quilt. It's all done by hand, often during Jude's commute. 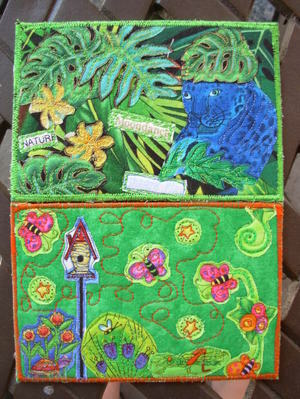 Other quilt ideas show up too and she has a companion blog called What If where you can see the results of her experimentation with fabric. I think that's enough for now. I'm on the lookout for great quilt blogs, so if you have a favorite I'd love to here about it in the comments. That fourth baby I was talking about in the last post was actually born on Saturday! I got the email just about 1/2 an hour after posting that. 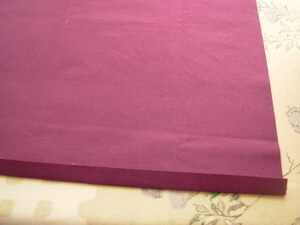 Well, now I've got a binding to finish too. 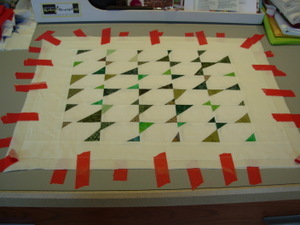 Since I'm here again, here are some photos of the quilting of that one. I forgot to mention that a huge difference in my machine quilting happened when I bought some of those machine quilting gloves. Huge difference!! 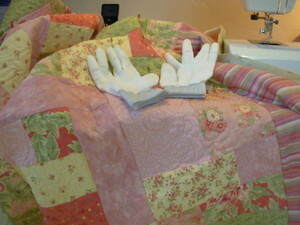 I realized my hands were slipping and that was making it really hard to control the quilt. The other thing that made a difference was lots of practice. 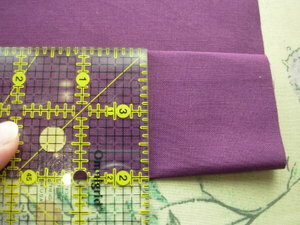 These are my sample machine quilting sandwiches I use whenever I feel I need to try it out before doing it on an actual quilt. I just keep adding to them. 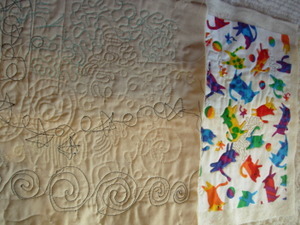 I made these for my first and only machine quilting class 7 or 8 years ago. I just realized I have two other quilts I started recently. 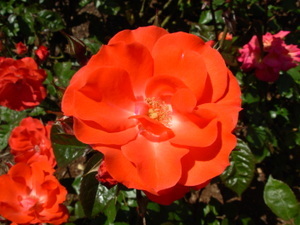 They are based on Gwen Marston's liberated exquisite block. I like these because they are so simple. 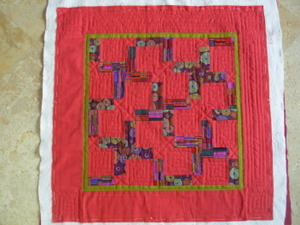 I made a red version right after buying the book, Liberated Quilting. That one was a one day project. These are on the back burner for a little while since I've got so many other things to do. Here's one of them. The other looks pretty much the same, but is rectangular rather than square. I used a bunch of leftover green triangle bits for this. Tonya requested a look at my quilt wip's and I'm happy to comply! 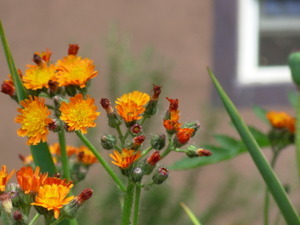 I've got so many things going at once, but if you've been reading this blog for any length of time you should know I love to start new things. I almost always get back to the old ones eventually, but it can be a while and that may be frustrating for some. First off, here's the third baby quilt, done and dusted. This one was quite a reach for me. 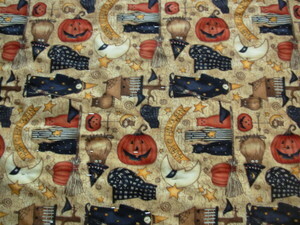 I finally decided I just have to get rid of my fear of free motion machine quilting. Don't look too closely at the quilting, but I do feel that I really stretched myself on this one. I tried some new shapes and they came out pretty good. This one has been sent off to baby Addison and I hope she likes it! Meanwhile, I joined the Doll Quilt Challenge group on Flickr just for fun and this is the June Challenge. It's a pattern called disappearing nine-patch. I have two more sides of the border to quilt and it'll be done. The July Challenge is a technique I've been really wanting to try called "confetti". Here's what you start out with. 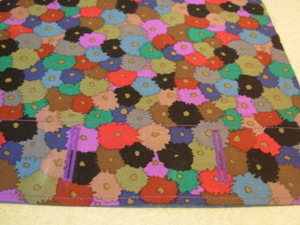 I made four nine-patches like this and sliced them as you see here, then rearranged the blocks into the pattern above. 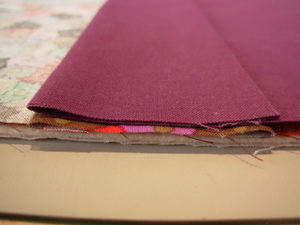 I really like these Kaffe Fasset colors. 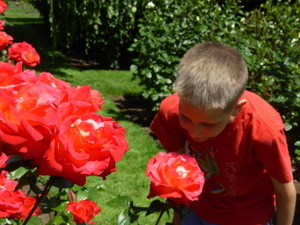 The red and green are examples of his shot cottons. That green is perhaps my most favorite fabric of all in my stash right now! Now, here's what Tonya really wants to see. I started this July 4th star quilt a few weeks ago after re-reading all of Gwen Marston's books (especially Liberated Quiltmaking). I really have come to love these liberated techniques. I wanted to try to get this done by the holiday, but with some travel coming up I may not be able to. 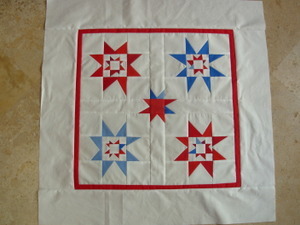 I plan to quilt this with free hand fans, a la Tonya. 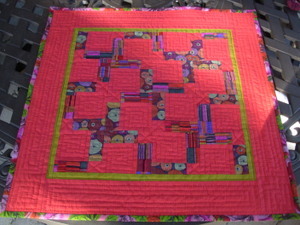 I have also just finished machine quilting the last of the four baby quilts I've been working on. The great thing about this one is that, as far as I know, the baby hasn't been born yet. 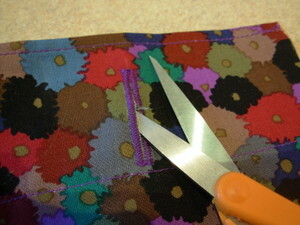 When I get the word, all I have to do is finish hand sewing the binding to the back and send it off! 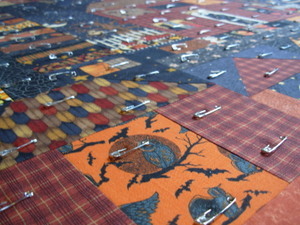 Right now I only have some close ups of the quilting, I'll get a full quilt photo later. I'm just so proud of the quilting on this one. I've really made progress! Lastly, after an extremely hectic week I finally had a long chunk of time today to work on this one. Seeing as how it's due to be turned in for the Sisters Quilt Show next week, it's about time I get to it. 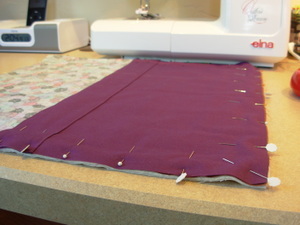 With my newfound machine quilting skills I am hoping this turns out okay. 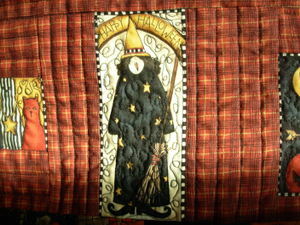 This one is called "The Witch is In" and was started last August after I got Gwen Marston and Freddy Moran's book, Collaborative Quilting. 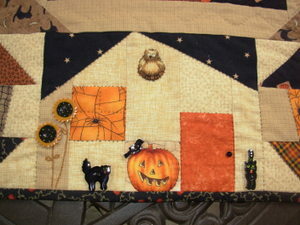 I have a tutorial on these free pieced pumpkins which you can find here. This afternoon I got it basted. 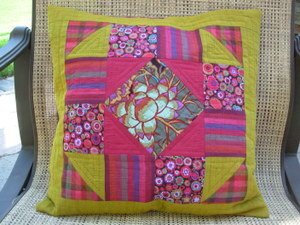 And I got quite a bit of the interior quilted. I should be able to get it done in the next few days. After I finished that little pink Baby Surprise Jacket I realized it wouldn't be too hard to make one with some leftovers for Dulaan. I knew the Dulann items were due soon and I was waiting for Chloe to finish the Dulaan scarf she was doing, so I cast on for a BSJ in some Lamb's Pride worsted. My goodness, this one is so cute I can hardly stand it! 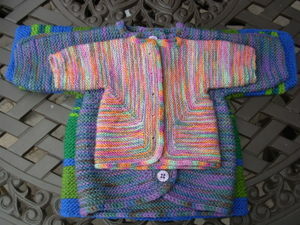 I love the stripes perhaps even more than the gorgeous variegations of the other two I've made. Here's the whole Dulaan haul, which was mailed yesterday! Ten items- whew! (7 hats, 1 neckwarmer, 1 scarf and 1 sweater). And, just for fun, here's the size comparison photo. 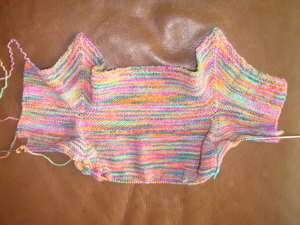 On the bottom we have a BSJ with Lamb's Pride worsted, size 8 needles and I would guess a 2T size. The middle one is made with Lorna's Laces Shepherd worsted, size 6 needles and about a 12 m size. The littlest one is Blue Moon Fiber Arts, Socks that Rock medium weight (colorway Fairgrounds- Tammy reminded me! 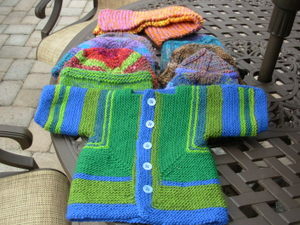 ), size 3 needles and newborn size. I'd also like to say that one thing I love about the BSJ is that due to it's rectangular construction (albeit an oddly shaped rectangle), variegated yarns work up wonderfully with no pooling! Also, stripes come out fabulous if you are using up leftovers and that's great because you are always knitting symmetrically in this pattern and you don't have to make sure to save yarn to make the sleeves match up as you might for a sweater made with traditional construction. 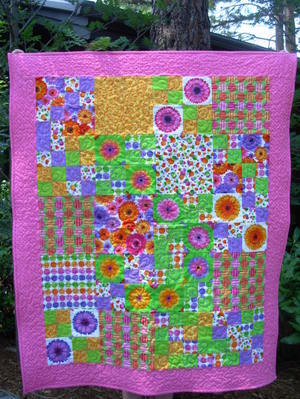 I suspect the knitters have all run away, what with so many quilts on this blog lately. But I have been knitting. 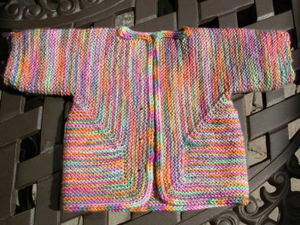 The lastest FO is this little Baby Surprise Jacket (Elizabeth Zimmermann's design). I don't have any immediate babies to give it to, so it will go to the FO cupboard and await a new little girl. I mainly did this because this skein of Socks that Rock medium weight has been staring me in the face for a long time. I tried making the sock pattern that came with this yarn, but it wasn't working for me. 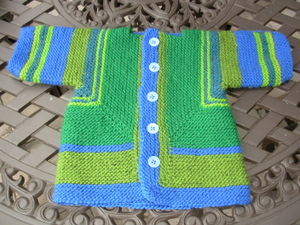 After I abandoned it, I saw several BSJ's made with this colorway around the blogosphere. I think it's rather tiny, so perhaps a premie could make use of it. How do you like that magic of the BSJ? And here are a couple of close-ups. I especially love these buttons! These letters are hand appliqued. 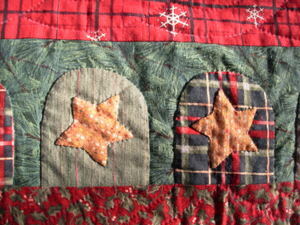 The blocks are judged and, if you win, you are entered into a contest to win a quilt. They will choose 48 blocks that will be divided into 4 groups. 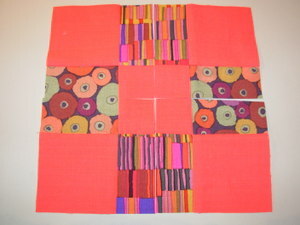 Each set of 12 will be made into a quilt (quilted and bound) and one of the 12 block makers will win the quilt! I think that's a pretty good deal. If your block doesn't make it into the ones that are chosen you can have it sent back to you, or donated for charity quilts. 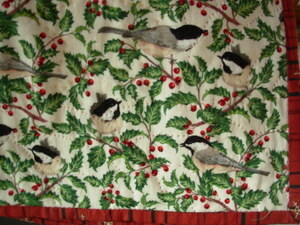 And here's the backing, with a sweet chickadee fabric I love. 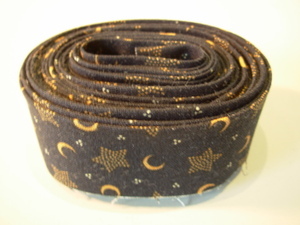 I've got a bunch more of this fabric so we'll see where it turns up next.